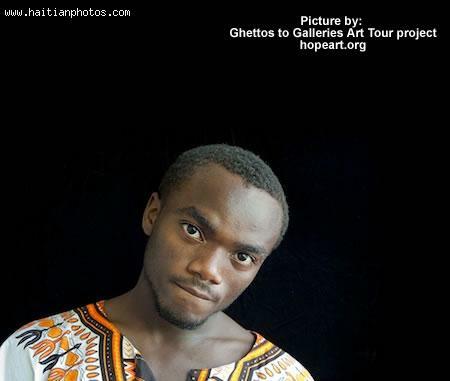 Jean Pierre describes how he initially always wanted a future in the political world, not finding his affinity for art until the first Ghetto Biennial put on by Grand Rue's Atis-Rezistans. Since his switch in life majors, Romel Jean Pierre has seen his prospects rise out of the Port-au-Prince dumps, into those of the San Francisco Bay Area. This past summer, Pierre was able to travel to the California art capital to showcase his unique form of art, along with two fellow Haitian artists, as part of the Recology Art Exhibiton. Either displaying a third-world perspective to first-world waste, or a true artist's perspective on all things that have matter, Pierre exclaimed, upon first viewing the Tunnel Avenue offerings, that the dumping of such potential art was a waste as the pieces were not garbage. The director of the art program, Deborah Munk, recognized Pierre's talent and its ability to help reshape how the patrons who would witness it would feel towards wastefulness. She hopes to use the exhibition to teach people to recycle and reduce their carbon footprint.